Here I am – in the middle of August and still no blog entry! Let’s just say that the Olympics made me stray!! Like a lot of people. 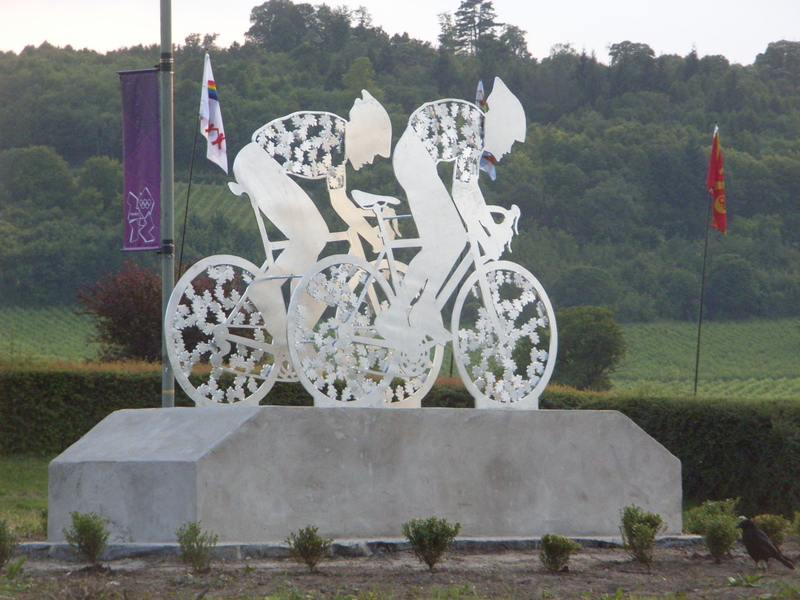 I am not usually a sports fan but got sucked in, and having the cycling come directly through Dorking at the very start of the games started the ball rolling so to speak ……. all very exciting! Here we saw athletes in their prime, and one would hope that as well as dedicated training, they had used optimum nutrition in order to attain this state. The other day, a friend, who is a keen runner, told me that there had been a third heart “incident” at his running club within the year. Thankfully the latest was still alive to tell the tale, but sadly the others, although quite young, were not. It is quite common for us to equate “fitness” and the ability to run, cycle, play squash or whatever with being healthy, but often nothing could be farther from the truth. I’ve heard many a time someone say “X can eat anything; he never puts an ounce of weight on”. X eats cake, chips, steak, you name it and remains stick thin, but being stick thin is NOT a measure of health. X may be constipated or get headaches, but never questions these, assuming them to be normal because “everyone” gets them. What X is experiencing is the norm, but it certainly isn’t normal. It isn’t normal to be constipated, or to have headaches. These are symptoms thrown up by the body to tell us that something is out of balance. Nor is it normal for women to experience painful menstruation or hot flushes at menopause (here’s an interesting snippet: the Japanese do not have a word for “hot flush” because with their traditional healthy diet, they do not experience them!). How many people have been to the doctors with aching joints and been told it’s just a part of growing old. No it’s not!!! And it is certainly not normal to keel over with a heart attack in mid-life or to manifest cancer at any time, whether you are young or in your 90s. We need to take special notice of the phrase “YOU ARE WHAT YOU EAT”. I know that our human makeup, complicated creatures that we are, is not just the sum of all the food we eat; we also have to take into consideration the air we breathe, our emotional responses to stress and experiences etc, but thinking about what we put in our mouths is a HUUUUUUUUUUUUUUUUUUUUUUGE part of the jigsaw which makes up “you”. Interestingly, people who have manifested cancer have said that they thought they were eating healthily. What were they using as a yardstick? Government guidelines. Oh dear!!! We have only got to look at two of the key sponsors of the Olympics – Coca Cola and MacDonald’s – to see that something is dreadfully wrong. This is simply a reflection of food lobbies, where big food companies use mega £s and a lot of clout to sway politicians’ thinking. As a result we have the comically low “5-a-day” message about fruit and vegetables and a big push about eating lots of animal protein. We do not need as much protein as we think AND, wait for it, we can get ample from plant-based diets. We don’t need to top up with lots of steak and nor do we need to drink milk. Did you know that the highest rates of osteoporosis are found in countries where dairy is a staple? For those of you worried about your bones, and health in general, ditch the milk and start eating greens!!! ! I recently read a superb phrase in a book: “Be an active participant in your own health”. Amen to that I say!! And to use an Olympic metaphor……… we have all cheered on our sporting heroes this past fortnight, and felt elated when they achieved gold. How about trying for a few golds ourselves? We don’t need to break any world records (although regular exercise is a big part of a healthy lifestyle) but we could set ourselves some goals to look after our insides better. I’m sure a lot of you know the spiel by now ……… more water, less stimulants (coffee, tea, alcohol), a zillion veg and fruit (Ok perhaps not quite that much but please aim for way more than 5-a-day), a lot less animal protein (if at all), ditch the cola and fast foods and other refined junk etc …..
I’m saying this, not as a killjoy, but as a concerned friend.